To cook the pork and beans: Place the pork, garlic, onion, bay leaves, peppercorns and salt into a large soup pot. Cover generously with water. Set over high heat and bring to a rolling boil. Skim off any foam that forms on top, then cover, reduce heat to low and cook until meat is tender, about an hour. Take off the heat. Remove the pork chunks and place in a bowl, set aside. Strain the pork cooking liquid into a large bowl. Set aside 4 cups to use for making the mole verde, and pour the rest of the liquid back into the soup pot. Set over high heat, incorporate the beans, and bring to a boil. Reduce heat to low, cover and cook for an hour or until tender. Remove from the heat and set aside. To make the mole verde: Place the tomatillos and chiles on a baking sheet and set under the broiler until they are completely charred, soft and mushy, anywhere from 8 to 10 minutes. Place the roasted tomatillos and chiles along with the garlic, onion, salt and pepper in the jar of a blender. Remove and discard the stems from the whole cloves, and add the tops or “berries” (may have already been crumbled) into the jar as well. Add 1 cup of the reserved pork broth and puree until completely smooth. Heat the oil in a large casserole over medium-high heat. Once hot, but not smoking, add the tomatillo puree. Cover partially with a lid and cook for 10 minutes, stirring occasionally, until thickened considerably and has deepened in color. In the jar of the blender, place the epazote, parsley and hoja santa along with remaining 3 cups of broth, and puree until completely smooth. Add to the casserole with the sauce and stir. When it comes to a simmer, add the reserved pork chunks and beans. Continue cooking at a medium simmer for 25 minutes or until meat is completely coming apart and mole verde has thickened again. Serve and let people garnish as they please with onion, radishes and squeezes of lime. Hope you love it Christina! This recipe is soooo good!! Everything I’ve tried from your show is so good. Every time you begin talking I start drooling and my stomach begins to growl! This was so freaking good! I can’t wait to make it again! Thank you! I just love your recipes sometimes I just want to print them and hand it to people and suggest that they try them. But my daughter so as I would probably offend them. So for the next potluck I will make it and have copies of the recipe so others can also enjoy! Aww thank you so much Martha! How much dried epazote would I use instead of fresh? The recipe calls for 1/2 cup of fresh leaves but I’m assuming I would use less if it’s dried. Would I use 1/4 cup or less? Great questions, Kathleen. When using dried versus fresh spices, you want to use about 1/3 of the fresh amount. So you will need about 2 tbsp and 2 tsp of dried epazote. If you want to make less, you can cut the recipe in half…but it makes really great leftovers. 5 out of 5 stars! One Serrano & one jalapeño pepper only, NO MORE, Its pretty spicy, a good spicy tho! Pati is at least as good as Rick Bayless when it comes to Mexican cooking, thats saying A LOT too! Excellent! I used all ingredients and it turned out scrumptious. I added a little shredded cheese too, yum. 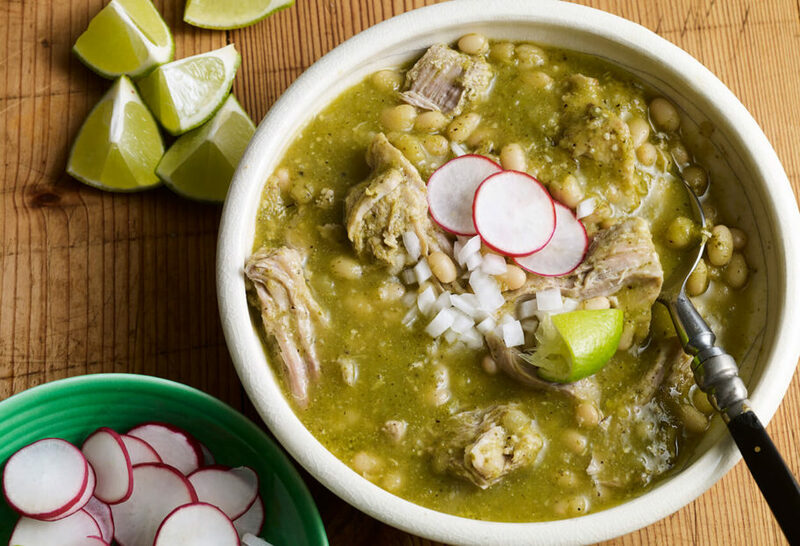 How about a green menudo recipes…! I don’t have one yet…but I will try to work on a recipe soon. It isn’t up on YouTube yet…but you can find the whole episode on Amazon https://www.amazon.com/gp/video/detail/B072185NT3 It is episode 7 of season 6. I hope your family enjoys it! Thanks Pati. Missed that one on CreateTV in Chicag. The recipe, while looking scrumptious, evaded this retired person. 😉 So thanks for links for Mr Aguilar. It’s now on my do next list!! Will report back. Hope you love it, Anne! Can I put hominy instead of beans and make it kinda like pozole? Love your show by the way and love you! Delicious! I kept this vegetarian (and vegan) with vegetable broth and small red potatoes subbing in for the pork, didn’t have epazote or hoja santa, and it was still delicious and very flavorful. This is especially awesome while the weather has been so cold! That’s awesome that you made it vegan! I’m so glad you enjoyed it, and stay warm! We made this for our Christmas dinner and my husband and I enjoyed it. It was was a cold snowy day and this dish was amazing. Thank you for sharing, Pati. I hope you are staying warm, Lisa and Rich! I have made pork and work with either pork shoulder or various cuts of pork . Can’t wait for another episode and would love to see the show where she makes tortillas at home both flour and corn . Thank you WETA for her show . She’s friendly and precise, very specific regarding different chilies . We saw this yesterday on PBS. You’ve inspired us ! We are making this today. It sounds wonderful. I hope you enjoy it Barb! I made this for dinner and wow! It was do good. I could only find dried epazote. How much do you recommend if dried versus fresh? I love your show and your recipes! If you used dried, use about 1/3 of the amount compared to the fresh. Dear Pati, For tonight’s dinner I made the Mole Verde with Pork & White Beans and my husband said that it was a “10”!!! He usually lets me know if he enjoyed a meal that I prepared, but honestly, this is the first time that I received a score…. thank you for sharing these delicious recipes. Love your TV shows and thoroughly enjoyed your trips to Morelia (my late Mom’s home town) & San Miguel de Allende. Looking forward to sharing other trips with you. Hahaha that is awesome! And I look forward to sharing many more trips with you. I made this mole Verde for last nites dinner and it was a hit, thank you so much for sharing all your culinary wisdom on Mexican food, my parents are from Torreon Cohauila and my mother and I love your show she really admires the fact that you keep it real and authentic with all your recipes, keep up the good work Pati. Aww thank you so much Eli…and please say thank you to your mom too. Where do I find epaxote and Santa leaves? You can try your local Latin Market, or international food store, or online. Pueden sustituirse los frijoles blancos por maiz del menudo…o tienen que ser frijoles blancos!!! ​Si los puedes substituir, seguro! My local market doesn’t carry fresh epazote leaves or fresh hoja santa leaves. Where would I find them online? The recipe looks good but I’m at a road block on those two herbs. You can look for them online…either fresh or you can use dried also. Or if you can’t find either you can substitute the epazote for fresh cilantro and skip the hoja santa. Hola Pati, can u PLEASE give me YOUR receipt for that good Mexican holiday punch that all mexican,s make on Christmas or Posada !! Thanks you happy holidays to you and ur familia BENDICIONES!! Other than the white beans, what is the difference between this and chili verde? ​This uses more Mexican herbs and has a different combination of ingredients…but they are both great! We’ll be making this weekend can’t wait ! Vamos a tener todo el sitio en español en un par de semanas…. Que gusto y orgullo ver a una gran mujer triunfar fuera de su país mostrando nuestras delicias culinarias. Pati me ha motivado a probar mis habilidades para cocinar. Ya veremos como sale este nuevo alumno. Felicidades y gracias Pati! That looks just sooooooo delicious so I immediately made an order for epazote and on the hunt for hoja santa leaves….I’m determined to make this…..!!! Watch your shows all the time on Create TV…. Yay! I hope you enjoy it Stuart. Hi Pati, I happen to have the good fortune of living in Mexico City at the moment (earthquakes aside), so would you be able to give me the names of the cut of pork (costillas sin hueso?) and the beans (maya? ), if you were making it here? Thank you! Should the beans be soaked the night before? No…they don’t need to be soaked. I just wrote you a letter and forgot to tell you that I still use cheese and eggs and some milk, lately, powered and just for coffee. Pati just started watching Create lately and have since discovered you. I love just about everything you cook, however I am trying to become a vegetarian and thinking I could substitute your meat for other ingredients, but still incorporate your wonderful spices and other ingredients. Would you be able to let me know what could be used instead? Don’t you ever change I think you’re wonderful and so full of life and have a very handsome family. For this Mole Verde you can add more beans…which are a great veggie substitute. Sounds delish, but can you explain what fresh “epazote” is? and “hojas santas”? I’ve heard of them, just not sure what they are and where to find them thanks! Yes…or you can also try to find dried epazote too. How do you cut a head of garlic “lengthwise”?. Do you mean stem to root or across the equator? Pati, I love that you use radishes for a garnish. I really like radishes and feel they are underappreciated. Thank you!!! Love your TV show. What are good substitutes for the epazote and hola santa leaves? For the epazote if you can’t find it fresh you can use dried…or you can substitute with fresh cilantro (it has a different but also great taste). For the hoja santa if you can’t find fresh leaves you can also use it dried or you can skip it.